The Linksys Velop AC2200 Simultaneous Tri-Band Mesh Whole Home Wi-Fi Router is a high-performing modular Wi-Fi system of nodes built to provide exceptional Wi-Fi coverage throughout your home. It sets up in minutes and delivers a flawless, ultra-fast, full-strength signal. Featuring Dynamic Tri-band technology, Velop outperforms the competition by providing faster speeds through its combination of three Wi-Fi radios, each tuned for optimal Wi-Fi load balancing to ensure peak Wi-Fi performance throughout the home. Velop with Intelligent MeshTM Technology is an award-winning family mesh Wi-Fi system created to work seamlessly together. Mix and match nodes with different speeds to customise performance or interchange colours to co-ordinate with your home style. Regardless of shape, size or wherever your internet comes in, Velop can be customised to your home. It provides seamless Wi-Fi everywhere and continuously optimises to find the fastest path to the internet. Unlike traditional routers with range extenders, each node provides a powerful Wi-Fi signal throughout your entire home. And as your home and family expands, you can easily add more nodes. It works with all internet service provider supplied equipment and speeds, and its simple app-based setup will get you up and running in minutes. 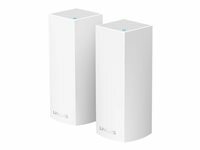 The Linksys WHW0302 Velop AC2200 Simultaneous Tri-Band Mesh Whole Home Wi-Fi Router two pack is a high-performing modular Wi-Fi system of nodes built to provide exceptional Wi-Fi coverage throughout your home. It sets up in minutes and delivers a flawless, ultra-fast, full-strength signal. Featuring Dynamic Tri-band technology, Velop outperforms the competition by providing faster speeds through its combination of three Wi-Fi radios, each tuned for optimal Wi-Fi load balancing to ensure peak Wi-Fi performance throughout the home. Tri-band technology ensuring delivery of blazing fast, seamless WiFi. Designed with hidden connections and a smaller footprint. Runs on one WiFi mesh network to deliver 100% full strength signal. Easily stream games and watch 4K/HD TV in peace with no interference. Intuitively easy setup will give you whole-home WiFi in minutes. Included internal antennas and vented sides for optimal cooling. Works with Amazon Alexa to enable interaction with Linksys using your voice. Setup parental control to restrict access to certain websites, creating boundaries. Wi-Fi That Sets You Free Linksys Velop is a high-performing modular Wi-Fi mesh system of nodes built to provide exceptional Wi-Fi coverage throughout your home. It sets up in minutes and delivers a flawless, ultra-fast, full-strength signal. 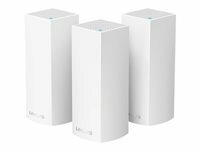 Tri-Band Mesh Wi-Fi Solution For Exceptional Speeds Featuring Dynamic Tri-band technology, Velop outperforms the competition by providing faster speeds through its combination of three Wi-Fi radios, each tuned for optimal Wi-Fi load balancing to ensure peak Wi-Fi performance throughout the home. Whether you're streaming 4K content, gaming, or video chatting, Velop delivers exceptionally fast Wi-Fi to ensure optimal performance even when multiple Wi-Fi devices are connected..
Modular Wi-Fi Solution That Configures To Your Needs Velop's modular design performs well within every home type, situation, and footprint. Each Velop node is a powerful Tri-Band connection point providing additional Wi-Fi coverage. Townhouse? Bungalow? Brick or steel? Simply add additional nodes to work around walls, problem areas, or multiple stories. A Single, Seamless Wi-Fi Experience The Velop mesh system operates as a singular network that works to ensure a 100% seamless connection as you move throughout your home. Backed By 3-Year Limited Warranty and Tech Support Velop carries a premium level of support and is backed not only by a three-year warranty, but also by a three-year tech support guarantee with a dedicated phone support line. Sleek, Compact Design Velop is designed for high-performance Wi-Fi. Each Velop features a beautiful, sleek design that can be placed in open spaces, and away from obstructions to provide the best in-home Wi-Fi experience. Velop Works with Amazon Alexa When paired with Amazon Alexa, Velop gives you access to a variety of convenient voice commands. For example, you can verbally turn Guest Wi-Fi on or off by stating, "Alexa, ask Linksys to turn on my guest Wi-Fi." The Linksys WHW0303 Velop AC2200 Simultaneous Tri-Band Mesh Whole Home Wi-Fi Router three pack is a high-performing modular Wi-Fi system of nodes built to provide exceptional Wi-Fi coverage throughout your home. It sets up in minutes and delivers a flawless, ultra-fast, full-strength signal. Featuring Dynamic Tri-band technology, Velop outperforms the competition by providing faster speeds through its combination of three Wi-Fi radios, each tuned for optimal Wi-Fi load balancing to ensure peak Wi-Fi performance throughout the home.